Patients with a variety of aesthetic issues affecting their smile may be able to enjoy improvements with a single solution. Dental veneers are among the most effective and flexible treatments in cosmetic dentistry. Made from durable dental porcelain, they provide long-term improvement to many of our patients’ smiles. The cosmetic dentists at Meadows Dental Group perform a comprehensive exam to determine if you are a good candidate for porcelain veneers. Call 303-790-2323 to schedule your appointment in Lone Tree, Colorado. We also welcome patients from Highlands Ranch, Centennial and other nearby areas. Veneers are small, very thin shells. When bonded to the teeth, they enhance the smile by addressing a wide range of cosmetic issues. Dental porcelain is very strong. Porcelain veneers can last up to a decade with proper care. The material is also resistant to staining, so you might want to get teeth whitening before veneers to keep the shade of your smile consistent. Many patients come to Meadows Dental Group with some knowledge of what porcelain veneers are. However, some get the idea from TV and elsewhere that veneers are an overnight solution for a better smile. The best results for veneers take time, during which Meadows Dental Group gets to know you, your goals and your expectations. Some patients who want straighter teeth need braces, but others can conceal spacing issues with veneers alone. Custom-made veneers fill the gaps between teeth, earning them the nickname “instant orthodontics” – even though they don’t affect the bite! Porcelain veneers are often part of a smile makeover that addresses multiple cosmetic issues in a series of procedures. However, veneers are also an effective option by themselves to enhance your smile. Your comprehensive consultation and exam is the best time to find out if dental veneers are right for you. In addition to evaluating your oral health, our dentists will discuss your dental hygiene habits. Veneers rely on the health of the teeth that support them, so it’s important that you maintain a strong foundation through regular brushing and flossing. Our cosmetic dentists will also evaluate your tooth enamel. A small amount of enamel is removed from each tooth in order to support porcelain veneers, which is irreversible. So, we will first make sure that you have sufficient healthy enamel to support the veneers before we proceed. During your initial examination, our cosmetic dentists will take panoramic X-rays of your teeth. For manageable changes like whitening, we might also take dental impressions. But, for bigger changes like crown lengthening, we might refer you directly to our dental lab. Meadows Dental Group has a longstanding partnership with a high-quality dental lab right here in the Denver area. Meeting directly with the lab tech gives you the opportunity to participate in the customization of your porcelain dental veneers. Our lab consistently delivers outstanding results, and we believe that the close relationship between Meadows Dental Group, the lab and our patients leads to predictable outcomes. After our dentists prepare your teeth, you will wear temporary veneers while the lab fabricates the final porcelain veneers. This will reduce tooth sensitivity and keep your smile from looking incomplete while you wait. When the porcelain veneers are ready, you will return to Meadows Dental Group. Our cosmetic dentists will remove the temporary shells and put the final veneers in place. 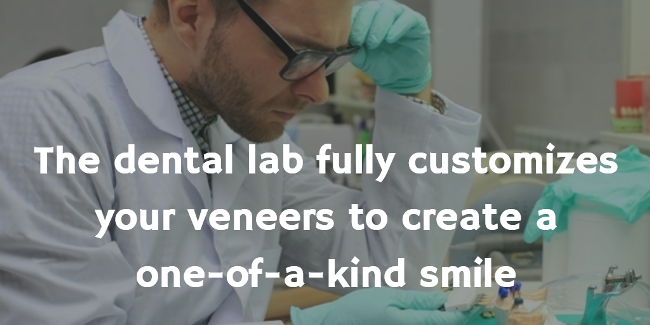 All told, the porcelain veneers process typically takes three to four appointments at our office and the lab. Our cosmetic dentists perform the tooth preparation and placement of permanent veneers using local anesthesia. The area being treated will be numb, so you won’t feel pain during either procedure. Post-treatment discomfort tends to subside quickly. Some patients want to make improvements to their smile, but fear of the dentist prevents them from attaining those goals. Meadows Dental Group provides sedation dentistry to help our patients feel comfortable during veneers placement and other treatments. Anxious patients may benefit from “laughing gas” (nitrous oxide) or oral conscious sedation during veneers appointments. 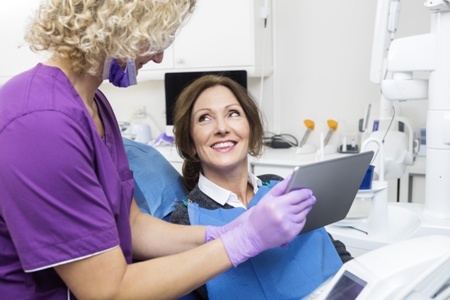 Our dentists are experienced providers of both sedation options, and we are happy to discuss the best one to help you relax during your visits. When you wear temporary veneers, be careful with chewy or hard foods and don’t put excess pressure on them. The temporary laminates are not as securely fastened to the teeth as the permanent veneers, and they might break off. Contact Meadows Dental Group ASAP if you damage or lose a temporary veneer. The underlying tooth is exposed, which constitutes a dental emergency. Once your permanent porcelain veneers are in place, continue with your regular oral health routine. Brushing, flossing and eating right will keep your teeth healthy and your veneers an effective complement to your smile. Some patients may experience tooth sensitivity after getting veneers, but this is usually temporary. If the sensitivity persists, however, let us know. Our cosmetic dentists will work with our dental lab to address the issue so your new smile is free from discomfort. Cosmetic and oral health considerations are both important when it comes to assessing your porcelain veneers candidacy. The initial exam by our dentists includes a thorough discussion of how veneers can help you, as well as what aspects could limit your successful veneers treatment. Patients considering veneers need to understand that they are NOT a one-size-fits-all treatment. They are customized to your smile, so what you pay will likely not be the same as another patient’s price tag. On average, porcelain veneers can cost as little as $1,100 or as much as $1,500. The exact price you pay, though, will depend on your needs, goals and the addition of other treatments to make you a good veneers candidate. Porcelain veneers are a cosmetic procedure, so dental insurance is very unlikely to provide coverage. However, Meadows Dental Group offers cosmetic dentistry financing to help our patients save on dental veneers and other procedures. We never want our patients to feel that they have to opt out of a treatment that can improve their self-confidence and sense of well-being just because a dental procedure isn’t covered. Members of our team will discuss our discounts and financing options during your initial consultation. Many of our patients find porcelain veneers enormously beneficial for their appearance as well as their self-esteem. When you visit Meadows Dental Group, our entire team will provide you with a warm welcome. You will find that your visit proceeds at a leisurely pace, during which our dentists will ask questions and gather information about what you would like to accomplish with your smile. At Meadows Dental Group, we don’t pressure you into a particular treatment. Our cosmetic dentists genuinely want to help you find the best cosmetic dentistry option. Learn about porcelain veneers and other options at Meadows Dental Group by calling 303-790-2323 today. Our cosmetic dentists serve patients in and around Lone Tree, Highlands Ranch, Centennial and other areas of Colorado.